Has anybody seen the vigilant fundraiser? The Vigilant Fundraiser is out there – I know it – but where?! The launch of the book The Vigilant Fundraiser was so successful that none of the authors even has a copy of the book. Why? Because the first run sold out at the AFP Congress held in Toronto this week. For people with a little less money to spend, The Vigilant Fundraiser comes in at just $24.95. 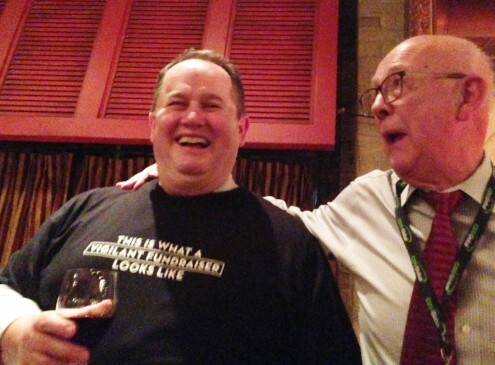 From the launch party, pictured here are editor extraordinaire and wine enthusiast, George Stanois, and to his right, the publisher of publishers, Jim Hilborn.